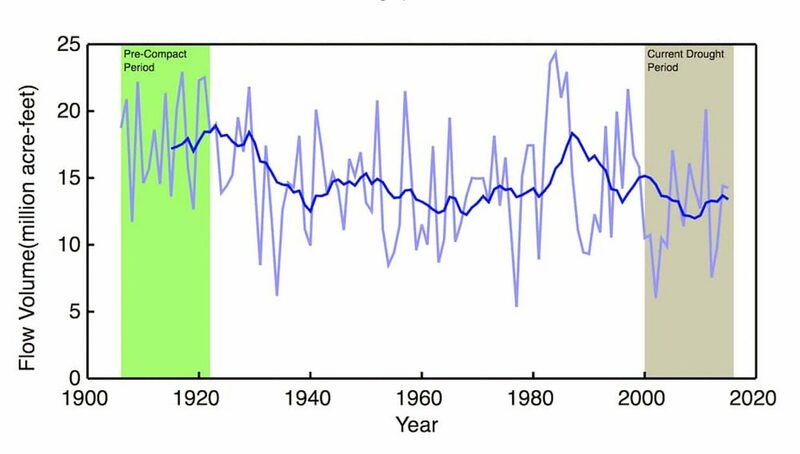 The flows at Lee Ferry have been declining gradually over the decades. 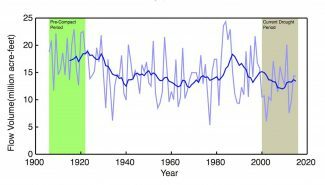 This graph shows the declining levels of water stored in Lake Powell. The “bathtub ring” reveals the extent of the drawdown of Lake Powell. ROCK SPRINGS, Wyo. — Wyoming's water czar warned residents in the Green River drainage that an unprecedented 19-year drought could force regulators to shut off water diversions if users don't voluntarily limit their use first. The Colorado River basin reservoir system that supports 40 million persons and a $1.4 trillion economy is at risk of severe disruption, State Engineer Patrick Tyrrell told stakeholders last week in Baggs, Rock Springs and Pinedale. Tyrell unveiled draft agreements among seven western states that could lead to voluntary, instead of mandatory, reductions in water use when that time comes. Demand management and associated programs, said Senior Assistant Attorney General Chris Brown, could conserve enough water on a voluntary basis "so I don't have to go turn somebody off upstream." 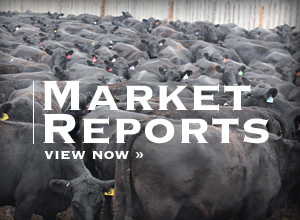 A demand-management program would be "an alternative to that hard regulation," Tyrrell said, in which those with the most recent water rights would be curtailed first. "We're doing it so we maintain control of our own destiny," Tyrrell said of the proposed agreements. Although Colorado River system reservoirs can hold four years worth of runoff from Wyoming mountains and other ranges across the 250,000 square-mile basin, persistent drought has reduced lakes Powell and Mead to 42 and 38 percent of their respective capacities. Water levels are receding to the point they could put power generation and other operations in the system at risk. 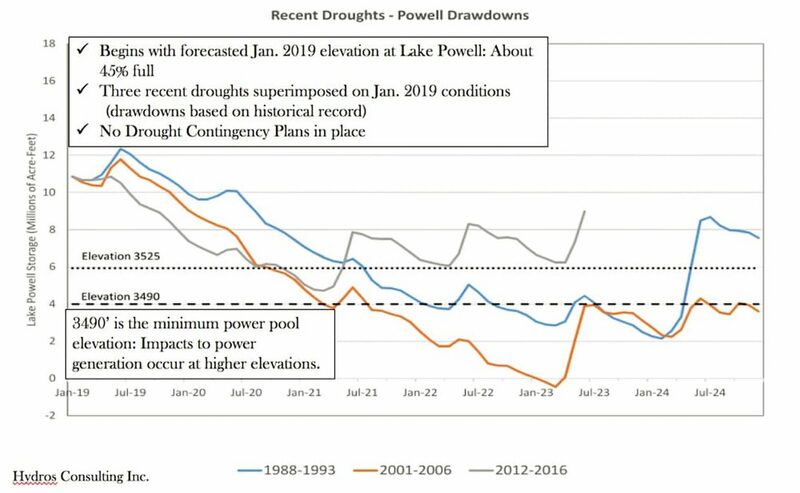 If drought conditions similar to 2012-2016, or 2001-2006 recur, Lake Powell would drop to a critical elevation within a year and a half — by June 2020, according to the presentation. That could trigger a cascading series of legal consequences requiring Wyoming water users to sacrifice. "Things are pretty dry," Tyrrell told more than 40 persons in Rock Springs on Oct. 10. August saw 2 percent of normal flow into Lake Powell, and September saw "well below" 1 percent of normal. 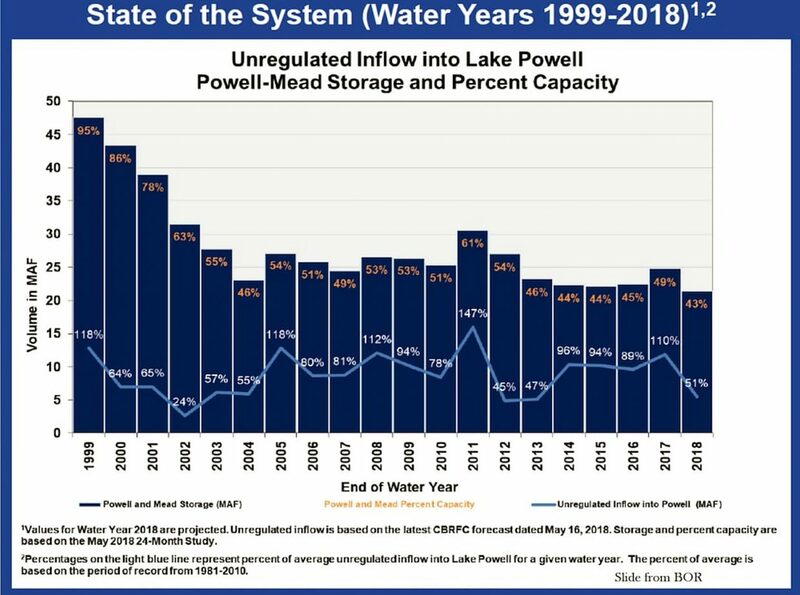 Mainstream Colorado River reservoirs Powell and Mead are the linchpins in the system and critical to Wyoming water users. Powell, 306 air miles from the state, helps ensure the upper-basin states deliver the required flows past Lee Ferry, allowing Wyoming water users to continue exercising their rights and using their appropriated water. Created by the 710-foot high Glen Canyon Dam, Lake Powell holds about 24.3 million acre-feet when full. Water pools to a depth of 583 feet. At capacity, the lake surface is 3,700 feet above sea level. But when water drops 330 feet to elevation 3,370, the reservoir is functionally empty. "You simply can't get the water out," Tyrrell told the Rock Springs audience that included irrigators, industrial users, wildlife officials and others. On Oct. 14, Powell was 108 feet below full pool at an elevation of 3,591 feet, the U.S. Bureau of Reclamation reported. Water was still 460 feet deep at the dam, according to Lake Powell Water Database, a private company. Forty million residents in the West who rely on water from the Colorado River face trouble long before the lake runs dry, however. The bottom of the "power pool," where the reservoir no longer generates electricity, is at elevation 3,490, 101 feet below today's surface. If Powell were to fall to that level, it would jeopardize electricity revenues that repay the U.S. Treasury for construction projects, generate operation and maintenance funds for system dams and electrical transmission, ensure compliance with the Endangered Species Act and other environmental laws, fund salinity control and secure $1.8 million annually for Wyoming's dams and canals. Put simply, if lake Powell becomes too shallow to generate hydroelectric power, the complex network of legal and financial arrangements that enable the watering of the West falls apart. In addition, the BOR fears it could lose generating capacity before that critical water level — the "minimum power pool" — is reached. The agency is "not sure where they lose power," said Steve Wolff, who oversees interstate streams issues for the State Engineer's Office. He was with Tyrrell and Brown at the presentations that drew another 40 or so persons to Pinedale and a smaller crowd at Baggs. Consequently, a key provision of the agreements proposed among Wyoming, Utah, Colorado, New Mexico, Arizona, Nevada and California is to set elevation 3,525 as the trigger point to avoid. "Trigger elevation" 3,525 is 66 feet below today's water level. 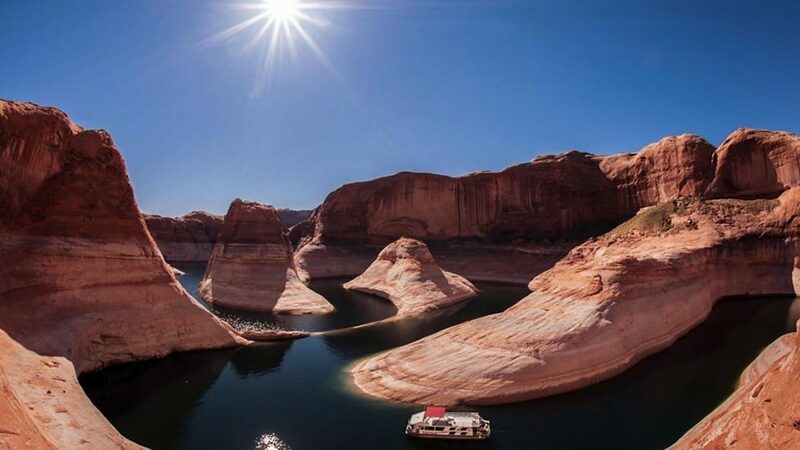 Lake Powell fell 36 feet in the last year, the BOR reports. If, starting now, weather patterns occur similar to those between 2012-2016, or 2001-2006 and no demand management program was in place, the lake would drop to elevation 3,525 within two years — by June, 2020 — according to forecasts Tyrrell presented. 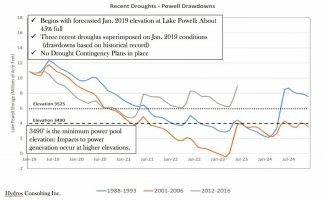 Under the proposed Upper Basin Drought Response Operations Agreement, "elevation 3,525 feet … will be considered the 'Target Elevation' for minimizing the risk of Lake Powell declining below minimum power pool." Consequently, "The Parties agree that this elevation appropriately balances the need to protect infrastructure, compact obligations, and operations at Glen Canyon Dam … with the Upper Division States' rights to put Colorado River System water to beneficial use," according to the proposed agreement. Wyoming should agree to the Upper Basin Drought Response Operations Agreement and the Upper Basin Demand Management Storage Agreement, documents that State Engineer Tyrrell has the authority to sign, he said. He also would sign a Companion Agreement that knits the upper states' agreements with similar documents to be signed by lower-basin states — Arizona, Nevada and California. 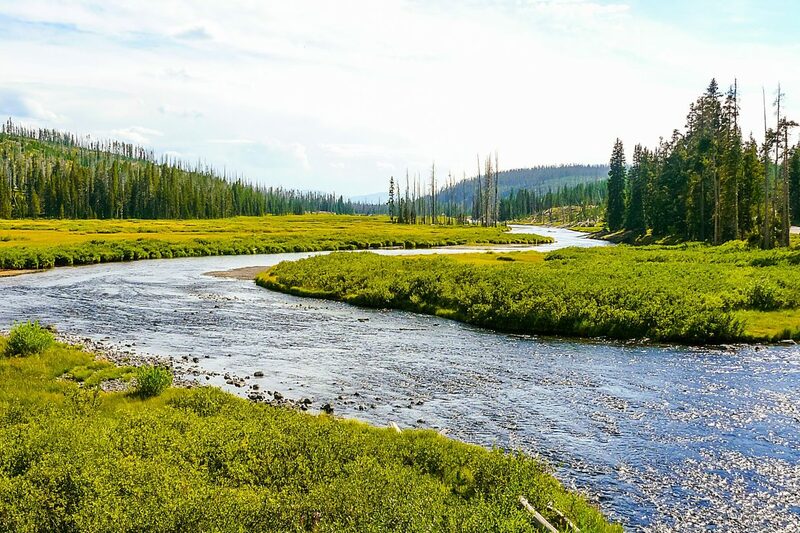 The agreements set a framework for managing water demand in Wyoming through a process that stakeholders still need to work out. Under a "stress test" analysis that used hydrology since 2008, Lake Powell runs about a 33 percent likelihood of reaching elevation 3,490 — below the proposed trigger elevation — in eight years if no demand management program is in place. With a program, that risk would be reduced to less than 5 percent, according to the presentation. Using more favorable hydrology — water supplies since 1906 — the risk would be around 18 percent without demand management and very low with a program of voluntary reduction of use. "It's kind of a pay me now or pay me later," Tyrrell said. "We're doing it so we maintain control of our own destiny." The alternative is "mandatory curtailment to meet compact obligations," — the turning off of supplies to junior water rights holders. 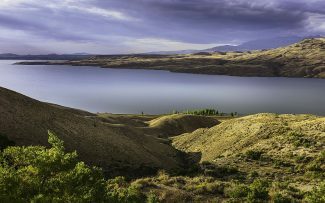 Under the doctrine of prior appropriation that governs Wyoming water law, that means the last water rights secured would be the first to be curtailed. Attorney Brown characterized the agreements as the states "just making promises to each other." Federal legislation, hoped for this year, would be required to tie the bundle of agreements together, he said. "When our forecast predicts that were going to be at 3,525, that's when we get together," Brown said. Officials are uncertain what a demand-management program in Wyoming would look like, but they've had a glimpse at a pilot project that successfully conserved water over the last four years. To explore whether there was interest among water rights holders in Wyoming, the Department of the Interior, the Denver Water Board, The Central Arizona Project (that sells water to Phoenix and Tucson), the Southern Nevada Water authority (that sells to Las Vegas), and Metropolitan Water of Southern California (that sells to Los Angeles and San Diego), funded the System Conservation Pilot Program. It paid irrigators up to $200 an acre-foot to forego late-season irrigation after hay was cut. Cheyenne attorney Karen Budd-Falen's family, which owns a ranch near Big Piney, participated, Budd-Falen told members of the Select Water Committee and Water Development Commission earlier this year. "The money was good and we're cutting hay anyway (and not irrigating), so why not get paid," she said. The program, which ended the day Tyrrell presented at Rock Springs, is anticipated to have conserved 14,617 acre-feet in Wyoming this year. Boosted by Trout Unlimited, among others, it generated $2.2 million to users who temporarily gave up a portion of their annual diversions. "The intent of the system conservation pilot program was simply to see if people would participate," Wolff said in an interview. "I think in that regard it was successful." But the agreements Tyrrell and other western water officials propose don't say how a full-fledged voluntary demand management program would work. That cake is not yet baked, Tyrrell and attorney Brown told their audiences; The proposed agreements would simply open the door to the kitchen. Among the issues, Tyrrell said, is money. "We're going to have to figure out how to fund that," he said. Also, upper basin states need a method to track, brand or shepherd their water to Lake Powell. Wyoming would get credit for conserving water — water that historically and normally would be consumptively diverted for irrigation or other uses — only when that conserved water can be tracked to Lake Powell without being diverted by other users along the way. "I have to be able to put my name on that water … put it in Lake Powell … so I can use it for what I want to use it for," Brown said. "How does Wyoming get our name on it?" he asked. "That has not been baked." "Who's going to be doing the books?" Brown asked. "We don't have an administrative entity taking care of this massive problem. Right now there's no mechanism." A water banking bill could be one tool to brand Wyoming water, according to lawmakers proposing such legislation. Wyoming, however, likely cannot bank water that has not been appropriated, an idea proposed by state Sen. Larry Hicks. Listing potential benefits of a water banking bill, Hicks earlier this year told members of the Select Water Committee "for the state of Wyoming, the biggest one is that unappropriated water. This gets to the whole ability of the state of Wyoming to exercise our full rights under the Colorado or any other compact." Colorado River laws apportion to Wyoming a little more than a million acre-feet a year, Wolff said in an interview. That's assuming the upper basin states provide the full 7.5 million acre-feet past Lee Ferry. "We get 14 percent of what's available in a year," he said. "There's a huge range in that. "We know that typically we haven't had that much," — 7.5 million acre-feet from the upper basin — he said. "It's closer to 6 million acre-feet." That puts Wyoming's allocation somewhere around 843,000 acre-feet a year, Wolff said. Wyoming's consumptive use also varies, but amounts to approximately 550,000 to 600,000 acre-feet a year, he said. That would leave some 243,000 acre-feet available to Wyoming to appropriate to consumptive users. But the state likely can't bottle that amount up and save it to meet its share of flows past Lee Ferry, Tyrrell, Brown and Wolff believe. "Any attempt to bank or sell our unused apportionment will run afoul of not only both Colorado River compacts, but probably all six other states on the river, plus the Department of Interior and Mexico," Tyrrell wrote in a Sept. 12 letter to Hicks and other members of the Joint Agriculture State and Public Lands and Water Resources Committee. "(W)e cannot withhold water we have not put to beneficial consumptive use." "It has to be water that was historically consumptively used and conserved," Brown told the Rock Springs audience. "We have to show we saved it." Added Tyrrell, "you have to have physically put it to use and then stopped." 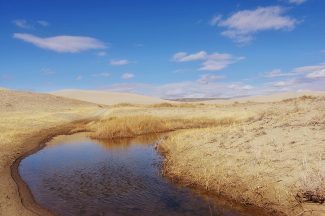 When Wyoming and other states develop a method to account for and track conserved water that would otherwise have been consumptively used — water like that forgone by the Budd family ranch near Big Piney, the agreements state that the BOR would store that at no cost in its reservoir system. "This does not require construction of storage," like new dams and reservoirs, Tyrrell said.Because the upper states cannot violate the minimum 10-year flow requirement at Lee Ferry, upper basin states will have to act early. Part of the reason is simple physics. "I've seen predictions It might take us two years," to get water to Lake Powell, Brown said. The proposed agreements are a preferable alternative to lawsuits, which would be "the mother of all interstate water litigation," Brown said. "This would be a mess," he said of any court action. 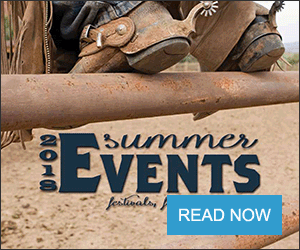 WyoFile is an independent nonprofit news organization focused on Wyoming people, places and policy. For more information, go to http://www.WyoFile.com.